"If they would just confirm to us that my brother is alive, if they would just let us see him, that’s all we want. But we can’t get anyone to give us any confirmation. My mother dies a hundred times every day. They don’t know what that is like." 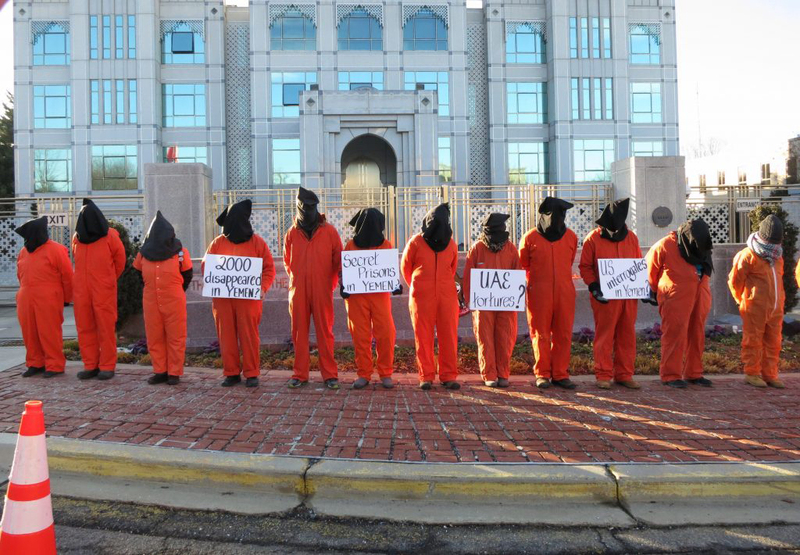 Witness Against Torture activists protest at the Embassy of the United Arab Emirates on January 9, 2018. Photo credit: Witness Against Torture. In July of 2018, an Amnesty International report entitled "God Knows If He’s Alive," documented the plight of dozens of families in southern Yemen whose loved ones have been tortured, killed, or forcibly disappeared by Yemeni security forces reporting to the United Arab Emirates (UAE). The UAE is part of the Saudi-led coalition that, with vital US support, has been bombarding and blockading famine and disease-ravaged Yemen for three brutal years. The disappearances, and torture, can sadly be laid at the doorstep of the United States. One testimonial after another echoes the sentiments of a woman whose husband has been held incommunicado for more than two years. "Shouldn’t they be given a trial?" she asked. "Why else are there courts? They shouldn’t be disappeared this way – not only are we unable to visit them, we don’t even know if they are dead or alive." The families are appealing to an unelected Yemeni exile government whose president, Abdrabbuh Mansur Hadi, (when "elected" president in 2012, he was the only candidate) generally resides in Riyadh, Saudi Arabia. The UAE has, so far, supported Hadi’s claim to govern Yemen. However, the Prosecutor General of Hadi’s government, as well as other officials, told Amnesty International the government of Yemen has no control over operations "spearheaded by the UAE and implemented by the Yemeni forces it backs." The Amnesty report implicates UAE-backed local forces in Yemen, as well as the UAE military, in the crimes of torture and other ill-treatment of detainees. Of seven former or current detainees interviewed by Amnesty, five said they were subjected to these abuses. "All seven witnessed other detainees being tortured," the report adds, "including one who said he saw a detainee held in a cell next to him being carried away in a body bag after he had been repeatedly tortured." "It is shocking, to say the least," the Amnesty report states, "that one year after a network of secret prisons operated by the UAE and the Yemeni forces it backs was exposed, these facilities continue to operate and that there has not been a serious investigation undertaken into credibly documented violations, including systemic torture in custody." The Amnesty report calls on the US to "facilitate independent oversight, including by the US Congress, over US military or intelligence cooperation with Yemeni and UAE forces involved in detention activities in Yemen." It further calls for investigating any involvement of US military or intelligence personnel in detention-related abuses in Yemen. On the same day that the Amnesty report was released, Saudi Arabia’s King Salman pardoned "all military men, who have taken part in the Operation Restoring Hope of their respective military and disciplinary penalties, in regard of some rules and disciplines." It seems likely that the Amnesty report precipitated this royal decree. Along with three countries in North Africa’s "Sahel" desert region, Yemen has been cited as part of the worst famine crisis in the 70-year history of the UN. In the past three years of aerial and naval attacks, Yemen’s key port of Hodeidah has remained partially or fully closed despite the country’s vital need for relief supplies. And, while Yemenis suffer the chaos and despair characteristic of war, the Saudis and UAE refer to the war as "Operation Restoring Hope." Many thousands of Yemenis, subjected to consistent bombing and threats of starvation and famine, have fled their homes. Many seek refuge out of Yemen. For instance, close to 500 Yemenis have traveled nearly 500 miles to reach a visa-free port on South Korea’s Jeju Island. On July 21, during an international phone call hosted by young friends in Afghanistan, listeners heard Kaia, a resident of Jeju Island, describe the "Hope School." She explained how she and several other young people are trying to help welcome Yemenis now living in their village of Gangjeong. The young people are already committed to peacefully resisting U.S. and South Korean military destruction of their shoreline and ecosystem. Now, they have started an informal school so Yemeni and South Korean residents can learn from one another. Small groups gather for conversational exchanges translated from Arabic to English to Korean. Many South Koreans can recall, in their own familial history, that seven million Koreans fled Japanese occupation of their land. Their Korean forebears relied on hospitality from people in other lands. The Catholic Bishop of the Jeju diocese, Monsignor Kang Woo-il, called on Koreans to embrace Yemeni refugees, labeling it a crime against human morality to shut the door on refugees and migrants. Kaia’s account of the newly launched school describes an effort that truthfully involves restoring hope. The cynical designation of Saudi and UAE led war in Yemen as "Operation Restoring Hope" creates an ugly smokescreen that distracts from the crucial need to investigate war crimes committed in Yemen today.